The first game of year 27 for reigning MVP Nneka Ogwumike got off to a bit of a rough start. Midway through the second quarter, Ogwumike went to the bench with four fouls and her team trailing by 17 points after Elena Delle Donne completed the three-point play following Nneka’s fourth foul. The second half was a different story for Ogwumike, who didn’t commit another foul the rest of the game, and the Sparks, who overcame a 17-point halftime deficit to rally past the Mystics for a 76-69 win. The victory not only extended L.A.’s win streak to eight games – the longest active streak in the league – it also made of a happier birthday for Ogwumike. Not only did the Sparks offense come to life in the second half (46 points compared to just 30 in the first 20 minutes), but their defense shined. L.A. held Washington to just 22 points in the second half. It is that balance of offense and defense that set elite teams apart from the rest of the league. There are three teams that rank in the top five in both offensive and defensive rating. And they happen to be the three teams that have reached double-digit wins so far this season. They also rank 1-2-3 in the power rankings for the third straight week. 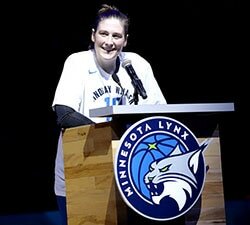 When it comes to excelling on both ends of the floor, look no further than the Minnesota Lynx. Their 96.0 defensive rating is more than three points better than any other team. And their 110.6 offensive rating is just 0.3 points behind league-leading L.A. They also lead the league in rebound percentage (54.2%), assist/turnover ratio (1.54) and rank third in true shooting percentage (56.3%). Since dropping two of their first four games to open the season, the Sparks are 10-1 since. Their active eight-game win streak has seen wins both small (five by single digits, including two by five points or less) less) and big (three double-digit wins, including a 31-point blowout). During this run, the Sparks are getting 17 points apiece (ironically with both making exactly 50 field goals) from Ogwumike and Parker. Ogwumike is putting up her usual efficient numbers (64.9 FG%), while Parker has been hot from beyond the arc (44.8 3P%). Outside of the setback in L.A. on Sunday, it was a good week for Washington, who picked up home wins over Seattle (100-70) and New York (67-54) to improve to 7-2 at Verizon Center this season. However, Sunday’s loss to the Sparks was the first of five straight road games for the Mystics, who are just 3-4 away from home this season. Saturday’s win over Indiana featured the latest in what has been a series of career-best games for Jonquel Jones this season. Whether it be points, rebounds, assists, steals or blocks, Jones has set a career-best mark in each early on this season. The latest personal best was 29 points against the Fever on a super-efficient 11-13 shooting, including a pair of 3-pointers. She added 15 rebounds during the 91-85 win to bring the once 1-5 Sun to 8-7 on the season. The Mercury celebrated Diana Taurasi Night to honor the league’s new all-time leading scorer on Friday night. Phoenix pulled out all the stops to honor the G.O.A.T., from bobbleheads and a petting zoo filled with goats for the fans in attendance. And when Taurasi knocked down a 3-pointer with 16.8 seconds left to pull the Mercury within two against the Lynx, there was a chance for a storybook ending. 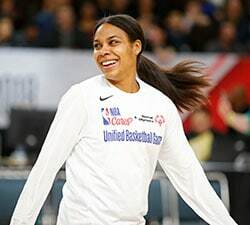 However, the Lynx sealed the game at the free throw line to hand the Mercury – and the goats – a loss in their only game of the week. After facing the top team in the West, the Mercury host the East-leading Mystics on Wednesday. Saturday’s matchup between Seattle and Dallas featured two teams headed in opposite directions with the Storm having lost six of their previous seven games and the Wings riding a four-game win streak. 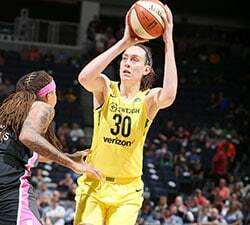 Breanna Stewart made sure those trends didn’t continue as she scored a season-high 30 points and grabbed 10 boards to lead Seattle to an 89-69 win. It was just the second road win of the season for Seattle (2-5), who are back at home (5-3) for five straight games beginning with a matchup against New York on Thursday. New York has lost three straight and four of their last five games to fall back to .500 for the first time in a month. After opening their four-game road trip with losses in Washington and Atlanta, the Liberty head out west this week for matchups with Seattle and Phoenix. While the Liberty have been strong at home (5-3 at MSG), they are just 2-4 on the road this season. After winning four games in the span of seven days, the Wings had to wait six days before stepping on the court again, and unfortunately they cooled down during the time off. Especially from beyond the 3-point line. The Wings shot just 1-17 (5.9%) from beyond the arc in their 89-69 loss to Seattle. Dallas will look to bounce back from the loss and the rough shooting night with a home-and-home series with Atlanta this week. Atlanta snapped a three-game skid with an 81-72 win over New York on Sunday. Considering they own the league’s second-best defense (99.2 points per 100 possessions), the Dream only need to hit the league average on offense (81.6 points per game) to find success. Atlanta is unbeaten in four games in which they’ve scored 80 points or more, compared to just 2-7 when they are held below 80 points. Saturday’s 91-85 loss to Connecticut was the Indiana’s sixth game of the season decided by six points or less. So far, the Fever are 4-2 in close games, which has helped them continue to hover around .500 despite having the league’s lowest-rated defense. This week, the Fever have a matchup with the Dream in Atlanta, with the Fever looking to improve on their 2-5 road record. 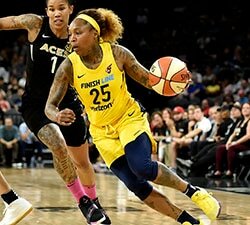 After falling to the team with the worst record in the WNBA (San Antonio was 0-14 at the time entering Friday’s game), the Sky now face the team with the best record in the league (12-1 Minnesota). And they do so at home, where the Sky have yet to win a game in seven tries this season. With an 89-82 win over Chicago on Friday, the San Antonio Stars finally broke into the win column, giving coach Vickie Johnson the first victory of her coaching career and ending the worst start in franchise history. The Stars had been close to breaking through for weeks, with seven of their previous nine losses coming by single digits, including three by five points or less. On Friday, they were finally able to close a game out, thanks in part to a key 3-pointer by Moriah Jefferson in the final minute to fend off a late Sky rally. The Stars also got double-doubles from Isabelle Harrison and Alex Montgomery, two of a season-high five players to score in double figures.